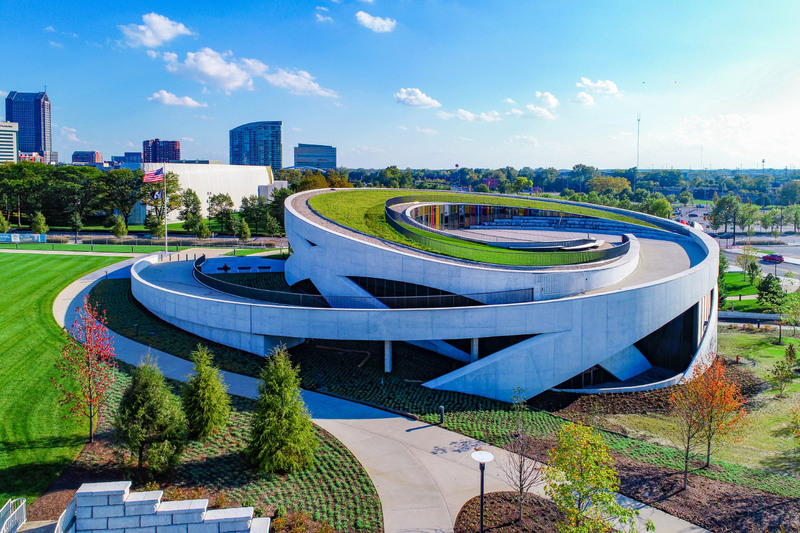 The concrete-wrapped National Veterans Memorial and Museum (NVMM) in Columbus, Ohio, is now complete and open to the public. 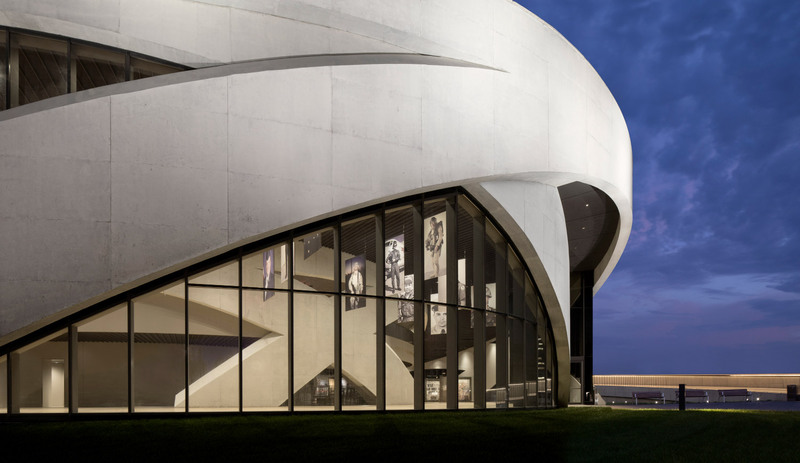 Rather than a traditional museum focused solely on exhibitions, the NVMM was envisioned as a memorial to departed veterans, a place of education, and as a gathering place for civic and commemorative events. 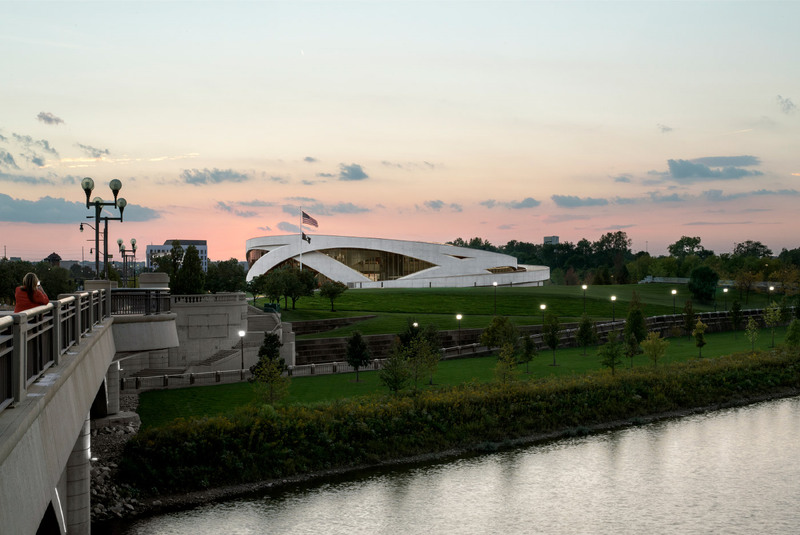 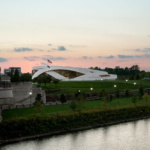 The NVMM, sited right on the banks of the Scioto River, integrates a contemplative OLIN-designed landscape with the Allied Works Architecture–designed two-story, 53,000-square-foot museum building. 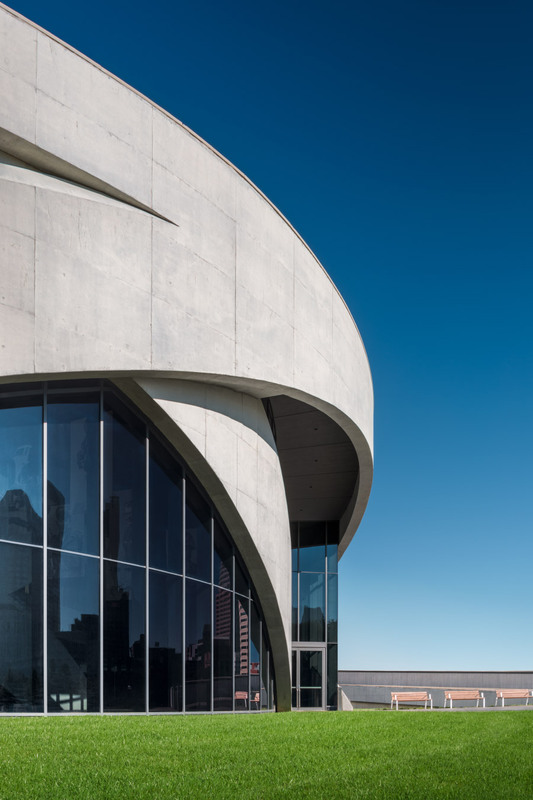 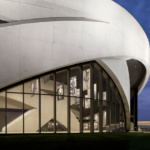 The round museum building features a distinctive cross-braced concrete facade over the main entrance—a motif repeated across the interior walls—which symbolically elevates a rooftop sanctuary plaza. 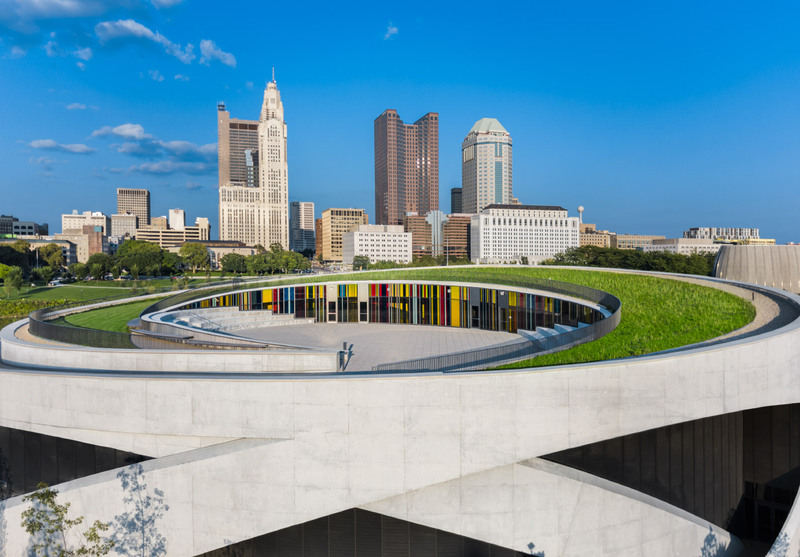 The skyline of downtown Columbus looms over the sanctuary, but the plaza is meant to be for reflection, events, and ceremonies exclusively. 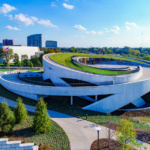 The sanctuary, which resembles a sunken amphitheater ringed by greenspace, can be accessed from inside the museum, or by traveling up a sloping concrete ramp that wraps around the building. 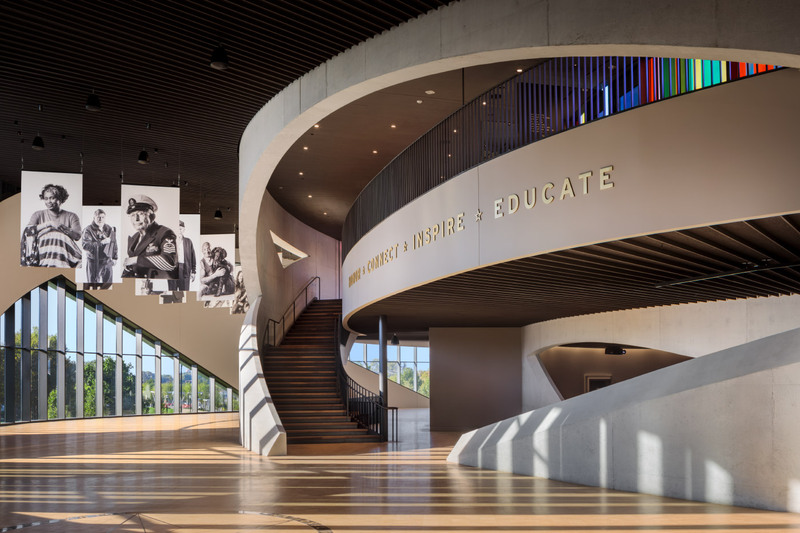 Inside, the museum’s exhibition spaces have been ringed around the perimeter of the building, affording plenty of natural light and views of the surrounding waterfront. 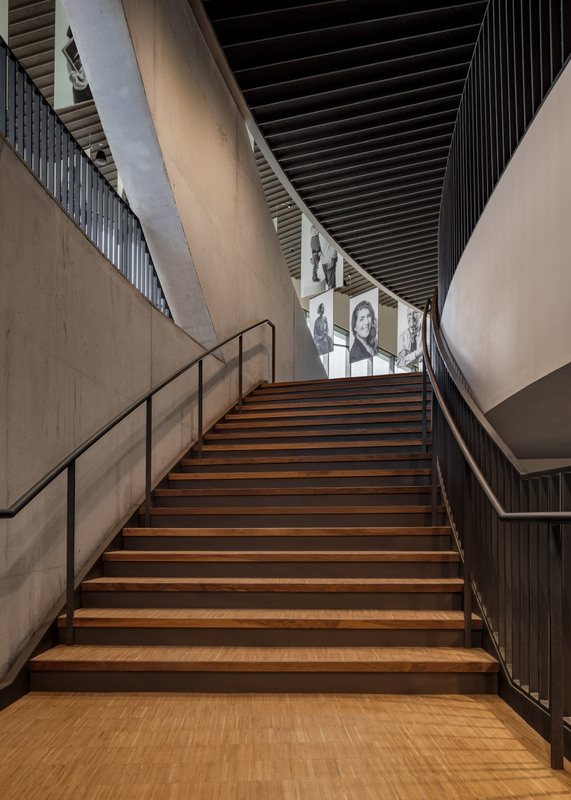 Past the ground floor lobby, a great hall offers views of the city as well as a place for gatherings and other events. 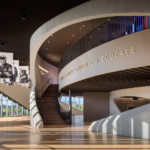 The NVMM’s programming, laid out by the creative agency Ralph Appelbaum Associates with the Veterans Advisory Committee, uses the museum’s circular structure to guide visitors through a storyline designed to connect them with veterans’ experiences. 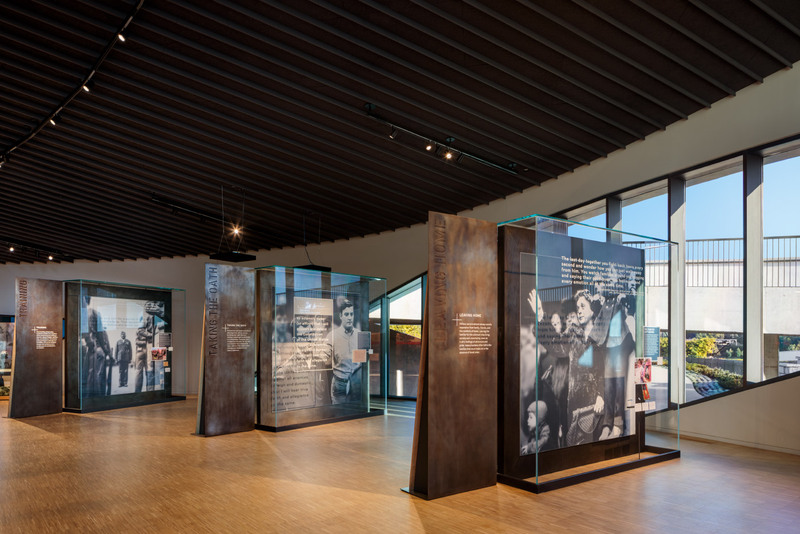 Films, sculptures, photos, and quotes from veterans are included throughout each phase of the story: leaving home, being in service, returning, and becoming a veteran. 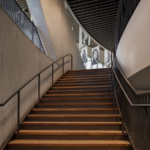 On the second floor, guests will find a remembrance gallery dedicated to veterans who have lost their lives and an entrance to the sanctuary plaza, connecting the building’s external structure to the internal features. 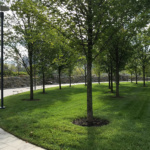 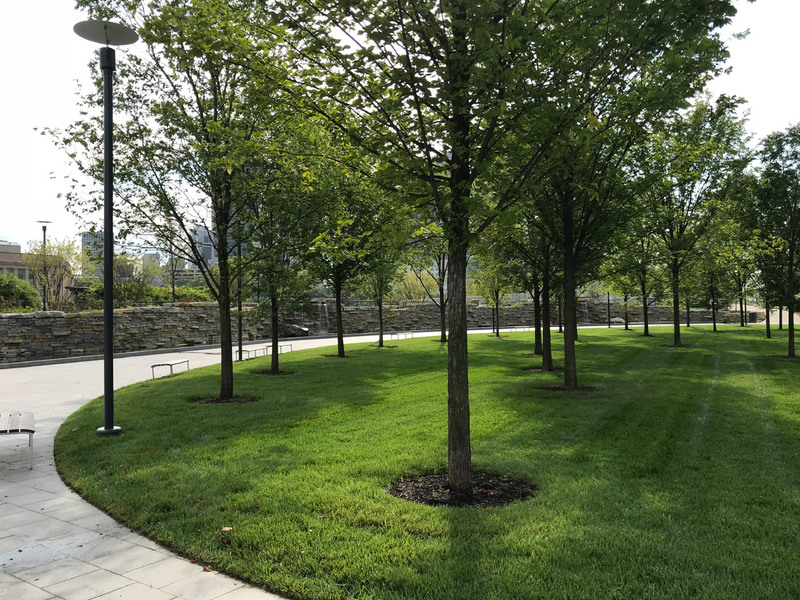 Outside, OLIN has designed a walkable landscape around the museum, including a circular path leading to a similarly-round memorial grove at its core. 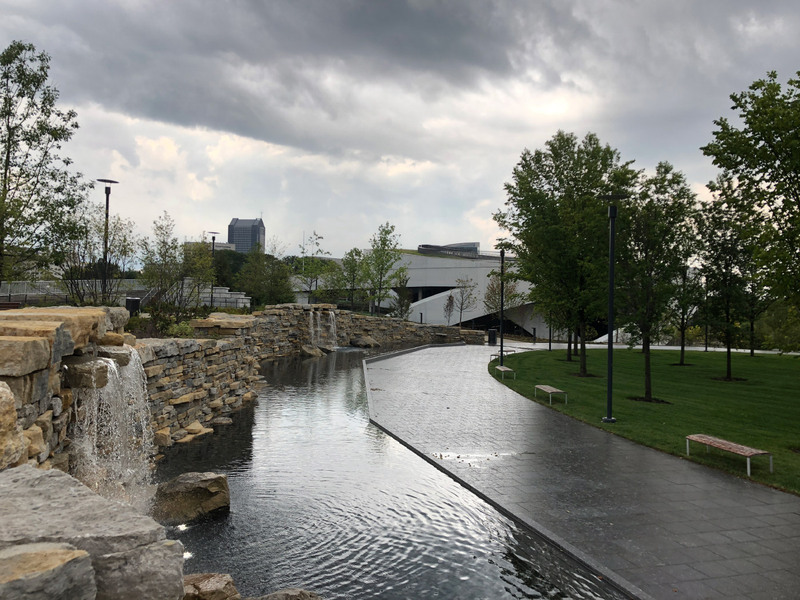 The grove has been bounded by a stacked-stone wall and several waterfall fountains that feed an illuminated reflecting pool below. 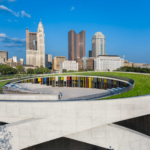 The design, development, and construction of the museum, as well as the push to have it designated as a national site, was led by the Columbus Downtown Development Corporation. 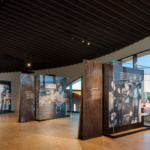 The NVMM is the country’s first national veterans museum, and as the project grew in scope, it eventually grew to include narratives and artifacts from veterans across every branch of the military and every state.